More new projects from Taylored Expressions! Taylored Expressions has released a new die set for Happy Trails stamp set called Happy Trails Accessories.There is already dies for the trailers called Happy Trails – Trailer dies. 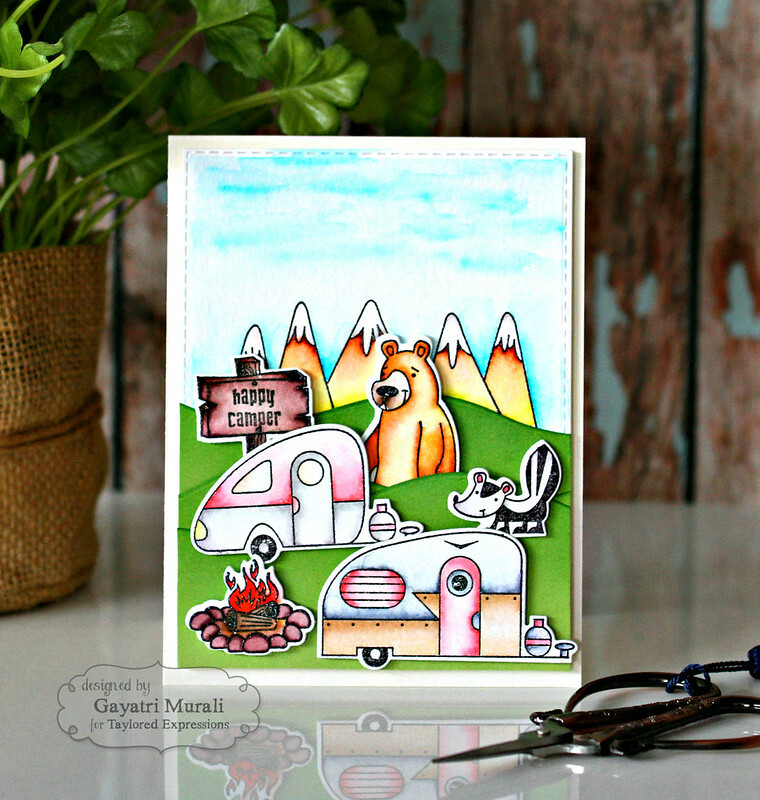 Together with the dies, Happy Trails stamp set is a must have camping set. I had great fun heat embossing the images and watercolouring them. Then I die cut them using the coordinating dies. 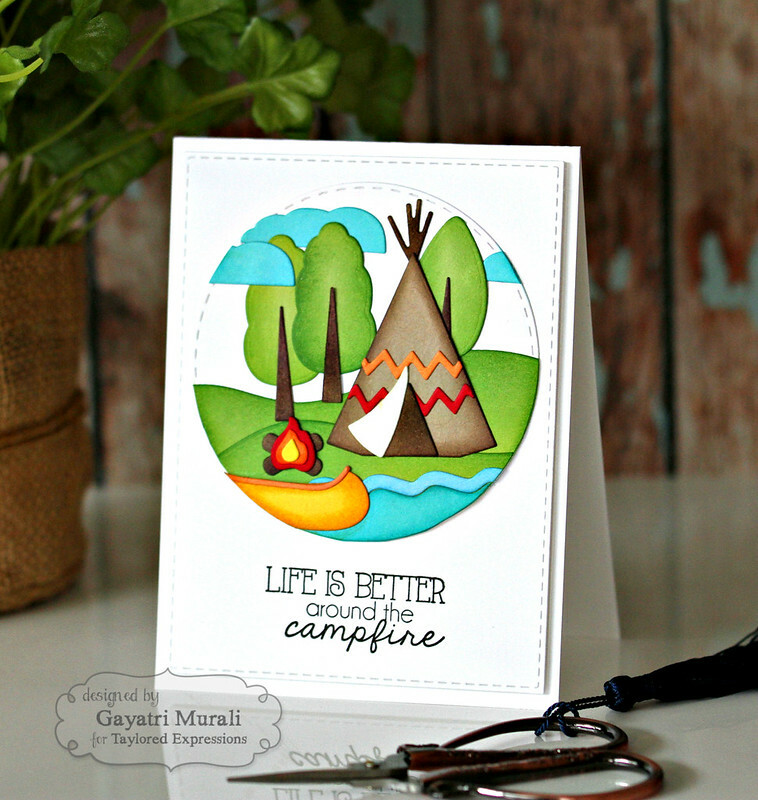 Using Build a Scene Rolling Hills dies from Taylored Expressions, I created a camping scene on my card. The sky is created using watercolour and the mountains from Happy Trails Stamp set. 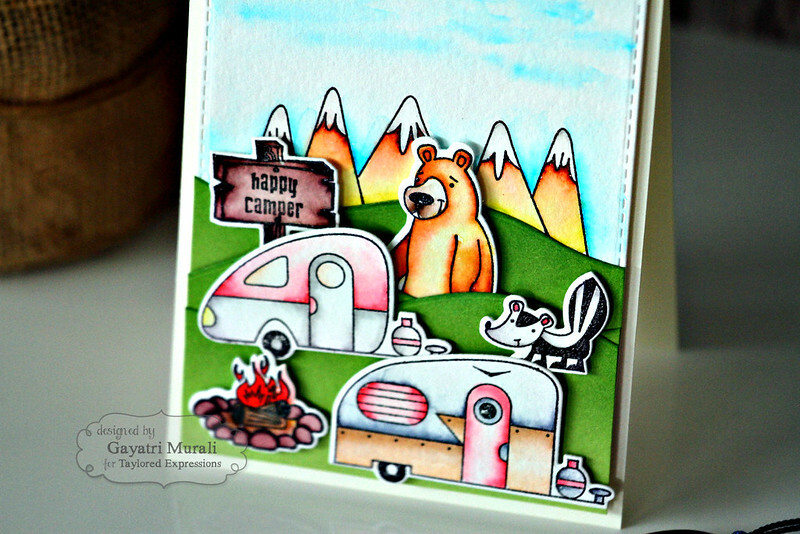 And my second card keeping with the camping theme. For this card, I have used Build a Scene: Lakeside die set, Lakeside Border and Paddle Out stamp set. The Build A Scene: Lakeside die set has everything to create a lakeside camp site. All I have done is to die cut using Taylored Expressions Premium cardstocks, sponged distress inks to give depth to the die cuts and adhered on the largest circle die cut from Stitched Circle Stacklets. Trimmed the excess of the circle. I adhered this on the stitched rectangle panel die cut using the largest Stitched Rectangle Stacklets. I stamped and heat embossed the sentiment below the circle. Love creating scenes. They make a big impact on the card. Hope you like my projects today. There are more inspirations using these new dies and stamp sets at by talented designers in the Taylored Expressions Gallery. Thanks for stopping by my blog today!